Finding a venue, costs, advertising, setting up the space. Using different instruments, Shruti Box, Chimes, Bird Whistles, Bowls and Percussion etc. There will be a practical evaluation at part three in which participants give a group sound bath. Eighteen practise treatments (case studies) will need to be carried out and written up to complete the course. 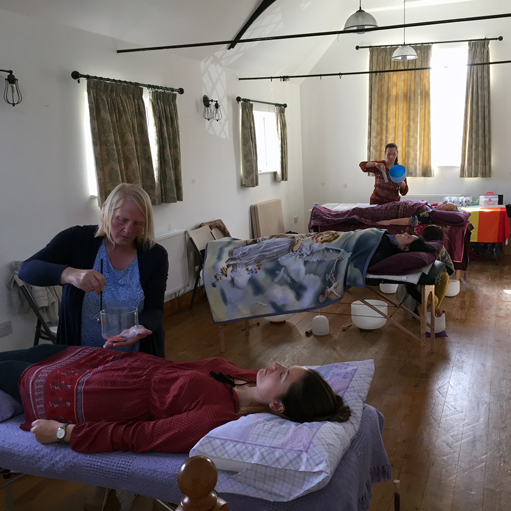 At the end of the course, provided the participants have satisfactorily completed their 18 case studies, the group sound bath assessment, attended all three weekends and completed an additional Sound Healing Workshop, they will be presented with their Crystal Bowl and Himalayan Bowl Practitioner’s Certificate. At Part Two of the Practitioner Training Course you will need to become a Student Member of the College. Student membership is £30-00 and has a duration of two years, giving you plenty of time to complete your Practitioner Training. To become a Student Member please go to the Membership page. £185.00 per weekend workshop and includes the course manual. Students will need to become Student Members of the College and have insurance cover while they are training. Student Membership costs £30.00 for two years and Insurance for Student Members is £35.50 per annum. Students will need to purchase three Crystal Bowls after Part One and three Himalayan Bowls after Part Two in order to do their case studies. Please contact the course Tutor to make sure that there is space on the course before you book your place. The number of places on each course is limited so that students can get the maximum support from the course Tutor. To reserve your place you will need to make an £85.00 deposit and the balance of £100.00 will need to be paid at least two weeks prior to each course weekend. All payments should be made to the Tutor directly by BACs or cheque. Please make sure that you fill in the booking form and send it to the Tutor. 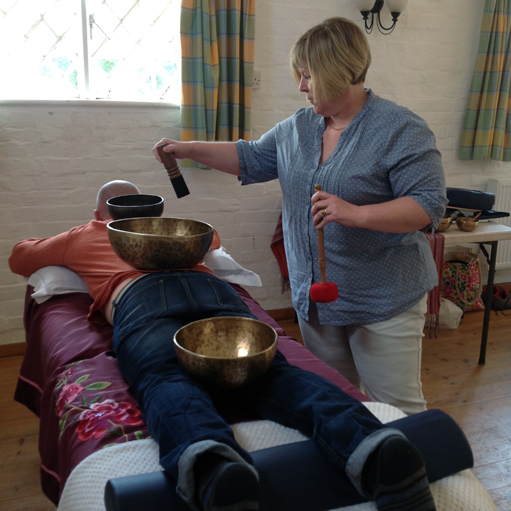 SG - "I thoroughly enjoyed the Singing Bowls practitioner training course. It was full of interesting content, both theory and practical and gave me more than enough tuition to be able to provide both one on one bowls treatments as well as incorporating the bowls into group sessions. Rob and June are excellent tutors who have a wealth of knowledge not only about the singing bowls but healing in general and provide a great opportunity to learn more about these amazing instruments in depth." Linda - "I recently finished my Bowl training with June and Rob, it was a very informative and they are both very knowledgeable on the subject. They are very open to questions. The group is small and held in a lovey building and location. 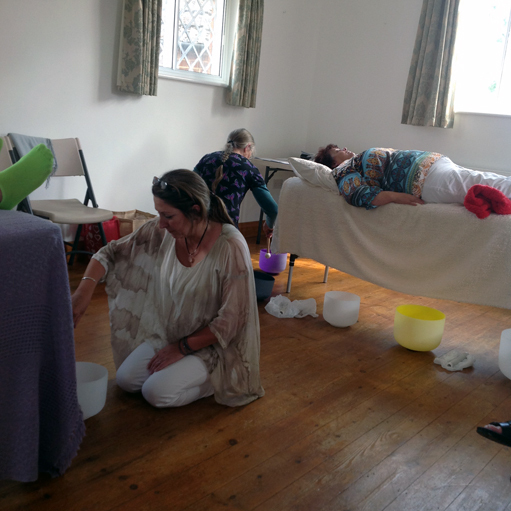 I have used bowls for a long time but this course opens you up to using them for excellent treatments with both the Crystal and Himalayan bowls with great results. The course is such good value both financially and the training given. June very kindly allows anyone to use her bowls etc if you haven’t got any and has a very large selection of bowls (and bags) to try before you buy! And they are a better price than many you see. I would highly recommend this course to anyone interested in energy and sound. Thank you so much June and Rob"
Dee - "I have just completed the Himalayan/Crystal Bowl Course with Rob and June Dickerson, I have thoroughly enjoyed the whole course, Rob and June make you feel comfortable as soon as you meet them. They are so knowledgeable about the bowls and shared that knowledge with us, the course was fun, interesting and instilled us with confidence and skills and has left me feeling competent to share what I have learned in the outside world. It was a lovely small group and we all connected so well the group dynamics worked beautifully, we were taught so many different levels of how to utilize the bowls including how to run a soundbath. I feel proud to be a part of the College Of Sound Healing and be one of its practitioners now."